I have a confession to make. A friend booked me two tix to catch a charity gig in which Padi will be performing. The tix cost seven smackers each. Padi is a band that is major in Indonesia (and other Melayu-speaking countries in south east Asia), as you would readily know. For some reason or other (perhaps checking out Piyu’s arsenal of Les Paul Customs and his effects chain), I went to their website and came across their rider, which was impressive. Now, this was befitting a band of Padi’s status – great songs/album sales, been around/touring for years etc. And I thought to myself, for seven quid, what will I get to see? 3 to 4 songs? On acoustic guitars with Yoyo on bongos? Pojok Musik kicked off with Spoonmen who played a decent set of tunes, which included Weezer and Malaysian covers (Hujan’s Kuala Lumpur and Couple’s Tentang Kita, to name two). Ably fronted by Fuad on his Gold Top LP, this band has a killer drummer. Weezer’s Say It Ain’t So with double pedals? Go figure. The Debt Offensive came up next, playing a style reminiscent of The Clash, or any London-based 70s punk band yang sewaktu dengannya. The only Indonesian connection in this band is the drummer, who reminds me of an old band mate of mine! Personally, their material wasn’t my cup of tea and I have to say, I wasn’t really impressed with the singing. Padi’s drum tech got on stage to get the venue’s kit to the best of Yoyo’s configuration (it was down to a four-piece, complimented by his own personal snare and a set of double pedals – his actual Tama kit can be seen here). 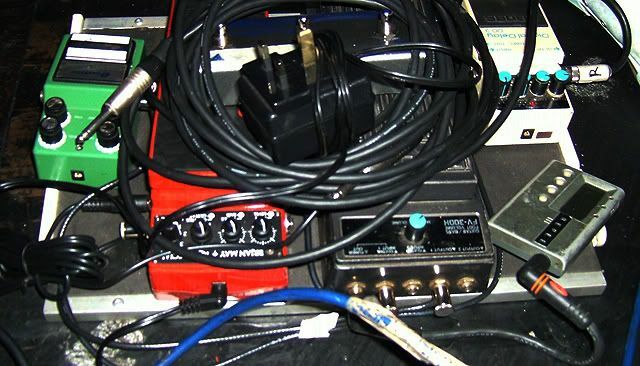 Piyu’s stomp boxes were down to a bare minimum, comprising a TS-9, a Digitech whammy Brian May red special, a DD-3, a Korg tuner and a volume pedal, linked to a JCM900 1×12″ combo (check out his impressive effects chain here). Couldn’t check out Rindra and Ari’s as it was way over yonder. The gig was so informal that Padi simply got onstage rather unannounced, plugging in their instruments. It was hard not to look at the set-list pasted on the monitors two inches from where I stood and they kicked off their set with a blazing rendition of Mahadewi. Piyu’s kamikaze Gibbo LP Custom was in my face, and I saw every note fretted. I enjoyed watching Rindra’s expressive stage presence (he had a fretless Precision) especially when he came over to stage left doing the classic leaning-on-the-guitarist pose during Perjalanan Ini. He was everywhere onstage! At one point, Rindra and Yoyo pulled off what I thought was Queen’s Under Pressure, only to hear Fadly rapping to Ice Ice flippin’ Baby. As Iedil pointed out, if the band is good, it could play anything only to sound uncringingly fantastic. Padi were a polite bunch, repeatingly thanking the crowd and humbly saying how it was their dream to play in London. Like any band that I’ve seen, their rendition of their lighter material like Menanti Sebuah Jawaban and Semua Tak Sama sounded heavy as fcuk. Yoyo didn’t disappoint the crowd as they segued into an impressive drum solo during Bayangkanlah. They ended their set with an incendiary Sobat – the first ever Padi song I listened to. In recent years, I have been the reserved, mildly head-nodding punter. It’s the age. However, last night, we felt like teens again. Devil’s horns for the Padi video crew, feng tau-ing to their more rocking material (if only they played Akhir Dunia) and finally, after 20 bloody years of going to gigs, getting myself a band’s set-list. I got a pick from Piyu, Idlan got some autographs and Mooke got herself a used (beli-beli drumstick tak main lah) drumstick from Yoyo! They had a limited amount of merchandise that they brought with them, and I managed to snag a commie-esque Sobat Padi tee for a tenner. Seven quid eh? This proves the point that you don’t need to play the Albert Hall to say that you’ve played London at a sold-out gig. Thanks to Manda for the heads up and to Oky for the tix.